Wado Karate is a Japanese martial art by Hironori Ohtsuka Sensei in 1934.Othsuka Sensei developed Wado after studying the Samurai martial art of Jiu-jitsu, and Shotokan ( another Style of karate). This combination , according to Othsuka Sensei, is a softer, more natural means of self-protection.The full name of the style is Wado-Ryu karate -do.The term Wado Ryu mean ” way of peace” or “way of harmony”.Indicating Othsuka Sensei’s original intention to use training in Wado as a means of solving problems in a non-violent way. Karate-Do means “way of empty hand”, as karate is, for the most part, studied without the use of weapons. The founder of JAPAN OKUMACHI KARATE DOJO is MR. Okumachi Koji (6th Dan Wado-kai). 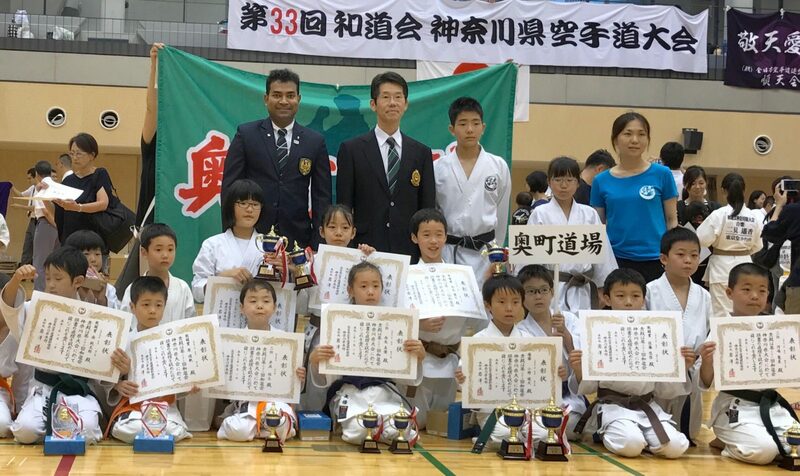 He is the direct students of Shihan Toru Arakawa who is the direct students of the founder of WADO MR. Hironori Ohtsuka. Sensei Okumachi Koji is the World Kata Champion in WADO 1994. Sensei Okumachi Koji completed Bachelor in English literature from Tamagawa University. JAPAN OKUMACHI KARATE DOJO started in 2000 and now has 10 Branches in Tokyo and Yokohama. From 2013 Sensei Okumachi hired Sensei Rakibul Islam (RAKI) from Europe, who has karate experience more than 25 years. Sensei Raki is 3rd Dan in Wado, Shotokan and Goju Ryu. He is qualified as a European karate instructor & referee and a national referee of Spain. He is also a member of JKF Wado-kai Japan & World Karate Federation. Sensei Raki was also teaching Karate at Bangladesh Army team. Bangladesh is the country where Sensei Raki was born in. We have more two instructors who are well experienced in karate wado-kai. They are Mr.Mitsuo Hosono Sensei(2nd Dan) and Ms.Yoshiko Aoki Sensei (2nd Dan). We have members of all ages, both men and women in our karate class. We believe that there is no limit for age to learn karatet. Wado Karate is not violent with its literally meaning, the way of peace and harmony. Karate also could mean the way of life for us, because our technique is a personal interpretation of our own natural mechanical evolution. You don’t have to compromise authenticity to fully understand our karate class. *Sports karate for National and International karate Competition. *Long Stick, Short Sticks and Chain Sticks (Nun Chaku). *Mama san Karate mean Mothers karate lesson.